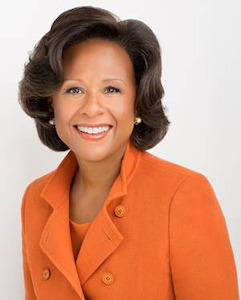 Wellesley College announced today it had selected Dr. Paula A. Johnson as its 14th president. Johnson will be the first African-American woman to lead the school that was founded in 1870. Johnson currently serves as chief of the Division of Women’s Health at Brigham and Women’s Hospital and is founder of the Mary Horrigan Connors Center for Women’s Health and Gender Biology. She is also a professor at the Harvard T.H. Chan School of Public Health and the former chairwoman of the Boston Public Health Commission. She went to public schools in Brooklyn and started college at age 16, at Harvard-Radcliffe, later training in internal and cardiovascular medicine at Brigham and Women’s. Her research has focused in part on the differences in how men and women respond to disease treatment. In an interview with WBUR on Thursday afternoon, Johnson said that moving from a career in women’s health to a Wellesley presidency was a “natural continuation.” She explained that her career-long focus on women’s health moved her to consider the role of higher education in shaping the lives of young women. “It seems to me that one of the big contributions she’s made in the world that she’s been working in has been as an advocate for women’s health and for making a priority of women’s health,” Wellesley Provost Andrew Shennan, who served on the presidential search committee, said in a phone interview. Johnson’s presidency will be a historic first for the college. Wellesley graduated its first Black student in 1887. As of 2014-2015, the student population was 5 percent Black, 9 percent Hispanic, 22 percent Asian, and 6 percent biracial or multiracial. Johnson will take office on July 1, according to a statement from Wellesley. Her selection as the next president of Wellesley is the culmination of an eight-month search to find a successor for H. Kim Bottomly, who announced she would step down as president this summer after nine years of service.